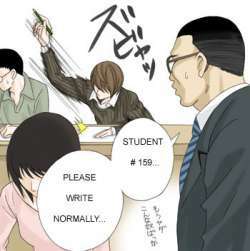 Epic Writing: Brought To You By Light Yagami. —Light Yagami, in this clip from Death Note. When you think about it, the vast majority of things we do in our everyday life are incredibly boring. Sports games? A bunch of people throw a ball around. Lunch? You put food in your mouth and chew it. Even now, you're staring at a screen with lights on it that changes slightly depending on how you push buttons on a keyboard. Talk about dull. ...And all of a sudden, we've got something epic. Well, in theory anyway- simply by reading this page you've made it substantially more obvious to yourself when the film editor is just screwing with your emotions with all these epic disclaimers, and indeed, egregious use of these tone-changers will be obvious to nearly anyone. Of course, effective use of this trope will blind the viewer with sheer awesome to the point that they won't notice. Large Hams are the living embodiment of this trope. This trope is highly likely to contain Melodrama. When this gets overdone, you often end up with Narm and It Gets Better. See also Mundane Utility (for awesome tools that are used to do mundane things), Invisibility Flicker (which reminds you that stealth and awesome do not mix, except when ninjas are involved), Hair Flip (a common way of making a small head movement dramatic), and Mundane Object Amazement (More focused on characters being amazed by mundane objects). Contrast with Unusually Uninteresting Sight. What Do You Mean It's Not an Index?